Kids are eager to learn about escape planning with the Sparky® Says: Get to know EDITH Video! 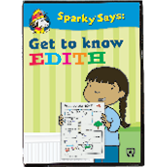 Make a big impact on little ones as NFPA®'s new Sparky Says: Get to know EDITH Video introduces them to E.D.I.T.H. -- Exit Drills In The Home. In this animated video, children take on the role of fire safety "expert" for their families as Sparky the Fire Dog® helps them understand how making and practicing a home fire escape plan can help people survive fire. Sparky inspires kids to make a difference. The video tells the engaging story of a group of friends who witness a fire on their way home from school. After learning that everyone got out safely because they practiced their escape plan, they decide to work with Sparky to make their own video showing how a typical family can protect themselves by making and practicing EDITH. Show good escape planning in action. After completing their video, the kids get a chance to show it on the evening news and let everyone know how important it is to make a plan and practice with EDITH. Build fire safety -- and reading -- skills, too.